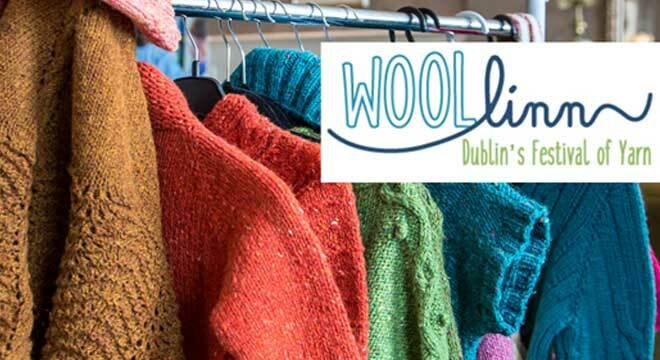 Woollinn, Dublin’s popular festival of yarn returns to Dublin in June 2019 and knittingtours.com will be there! Join our 9 Night tour which will include the first two days at the show with an exclusive knitting class with Carol Feller at the event! Your package for Woollinn includes a two day pass to the event, granting access to the marketplace and all associated "bonus" events such as demonstrations, exhibitions and social get-togethers, a ticket to the formal Woollinn Dinner on Friday Night. You will also be entitled to a 10% discount off any of the classes that you would like to book. We will spend three days in the Dublin area to enjoy the show and see some of Dublin City’s best attractions. After some time in the Boyne Valley at the Old Mellifont Abbey and a tapestry workshop with Aine Dunne, we will stop over in Cavan for two nights, often referred to as Ireland’s Lakeland County, the region is dotted with many stunning lakes and hills. Here we meet Sandra from Crafts of Ireland for an Irish Crochet Rose Motif workshop as well as spinning and sock knitting demonstration on an antique sock knitting machine. We will also meet Jess from Olann.ie who produces beautiful hand died yarn from her hub in Cavan for a short dyeing demonstration. For the final leg of our journey we travel to Donegal where our exploits will be a trip to Studio Donegal in Kilcar, visiting the stunning Slieve League Cliffs and the quaint folk village at Glencolmcille. In Donegal we will have an Aran knitting workshop with one of our most loved knitting instructors, Edel MacBride. A voucher code for 10% off any three-hour workshop at Woollinn, note you would book the workshop yourself when the workshops go on sale likely in late November. We will provide you with booking information. For non knitters or those that want to do some Dublin sightseeing today, there will be an optional tour of Dublin included. At 1pm, meet at Hotel reception and begin your sightseeing with a panoramic tour of Dublin City. Visit the National Museum of Archeology. The Museum of Archaeology is home to the Irish Antiquities Division of the National Museum of Ireland which is the national repository for all archaeological objects found in Ireland. It holds in trust for the nation and the world a series of outstanding archaeological collections spanning millennia of Irish history and also holds extensive collections of non-Irish antiquities. The museum houses artefacts ranging in date from 7000 B.C. to the late medieval period and beyond. Return to your hotel in time for dinner which includes a sit-down meal and entertainment, with some of the Woollinn Special Guests in attendance! Dinner will be included for knitters and non knitters. Overnight in Meath, Dinner, Bed & Breakfast included. For those that want to spend another day at Woollinn, the option is there for you. Otherwise there will be return transfers to/from Dublin included so that you can do your own personal sightseeing. Overnight in Meath, Bed & Breakfast included. This morning meet with Carol Feller for an exlcusive KnittingTours.Com three hour workshop at Woollinn. Carol’s popular class on Short Rows works students through several different ways of creating short rows until they find the method that perfectly suits them. Once the short rows have been perfected you will explore innovative ways to use your short rows and incorporate them into your work! After time for lunch on your own, we will take at tour of Malahide Castle, This premier attraction set on 260 acres of lush gardens. This 12th century castle had been home to the Talbot for over 800 years. Continue to Dublin City and pay a visit to the Guinness Storehouse for a guided tour. Located in the heart of the iconic St. James's Gate Brewery in Dublin, this production site has been home to the Guinness Brewery since 1759, when Arthur Guinness signed a 9000 year lease! Return to your hotel in time for dinner. Overnight in Meath, Dinner, Bed & Breakfast included. Leaving Dublin we travel to Drogheda to meet Aine Dunne a tapestry weaver and artist, resident and working from the Boyne Valley. With Aine and her team, you will enjoy a tapestry workshop and try your hand at weaving a sample piece on a four-sided tapestry frame loom. During your time with Aine you will gain insight into her designs, weaving methods and work schedule. Today, we will also meet Jess from Olann.ie who produces beautiful hand died yarn from her hub in Cavan for a short dyeing demonstration. For non knitters we will arrange a trip to nearby Drogheda where places of interest include Oliver Plunketts Head at St. Peter's Church! After lunch nearby (included), we will all head off to tour the Boyne Valley. The Boyne Valley is one of Ireland’s most historic regions. We will enjoy a guided tour of Old Mellifont Abbey the first Cistercian monastery in Ireland, founded in 1142 by Saint Malachy, Archbishop of Armagh. In 1603 the famous Treaty of Mellifont was signed at Mellifont Abey between the English Crown and Hugh O' Neill, Earl of Tyrone. Overnight in Cavan, Dinner, Bed & Breakfast included. Day 5: Crochet Rose Workshop, Sock Knitting and Spining Demonstration at Crafts of Ireland. Today we partner with Sandra at Crafts of Ireland some craft activities. Non knitters or those that prefer to do some touring can do some additional Boyne Valley sightseeing including a visit to the Hertiage town of Trim and Trim Castle. The group at Crafts of Ireland will learn how to Crochet a traditional irish Rose motif that often adorns Irish knitwear, see a spinning demonstration as well as a sock knitting demonstration on an antique sock knitting machine. For non knitters we will arrange a trip to the heritage town of Trim and a tour of Trim Castle. After the craft workshops we will continue with our Boyne Valley Sighseeting visiting Kells Heritage town and Kells Monastic Site. Overnight in Cavan, Bed & Breakfast included. Set off early, traveling along the Northwest coast to the Belleek Pottery Centre. Here a guided tour takes you through all aspects of pottery production which has been in operation since the 1800’s. Continue to Donegal Craft Village where time will be allowed for you to have lunch on your own or simply walk around the craft shops. Of particular interest to you may be the Weaving and Felting studios. Continue to Donegal and check into your hotel. For those that want to, there will be optional free time in Donegal town where you can choose to visit the Castle or maybe visit Magee Tweed, a shop specialising in Donegal tweed that has been running from the 1800’s. Overnight in Donegal, Bed & Breakfast included. Begin your day with a visit to Studio Donegal, a hand-weaving and clothing manufacturing business committed to preserving and promoting traditional Irish hand-weaving. Here you will see the process of hand-weaving including the spinning, warping and weaving of the wool. Beautifully tailored vests, jackets and homeware products are made on site from their own fabrics. Studio Donegal’s soft Merino yarn is dyed and spun in the region and sold on site. Next stop is the stunningly beautiful Slieve League Cliffs some of the highest and finest marine cliffs in Europe and the inspiration for Edel’s locally spun Sliabh Liag wool; we will have a quick bite to eat before we continue with the tour. Travel onward to Glencolmcille Folk Village, a collection of several small cottages, called a ‘clachan’, resting on a hillside that overlooks the stunning Glen Bay Beach. Designed, constructed and conserved by local people, the Folk Village is one of Ireland's longest running living-history museums. Overnight in Donegal, Bed & Breakfast Included. Check out of your hotel and return to Dublin via the Ulster American Folk Park in Omagh. The Ulster American Folk Park explores the historical link between Ulster and America, focusing particularly on the lifestyle and experiences of those immigrants who sailed from Ulster to America in the 18th and 19th centuries. Of particular interest to you may be the weaver’s cottage where you will see an authentic handloom which would have been used to weave tweed or linen by the man of the house while his wife spun the flax fibres into yarn and the children carded and combed the flax in preparation for the spinning wheel. Staff here will give you a demonstration on the spinning wheel and tell you all about traditional yarn dyeing methods. Your final stop today will be Carrickmacross Lace to see the fine lace masterpieces that have been produced in the region since the early 1800’s. Enjoy a demonstration where staff that are passionate about the beauty of this meticulously created craft will show you the intricate needlework involved with creating the finished pieces. Continue to your hotel in Dublin City Centre Hotel and check in. The remainder of the day is free for personal sighseeing or shopping before our final farewell dinner tonight. Overnight in Dublin, Dinner, Bed & Breakfast included.